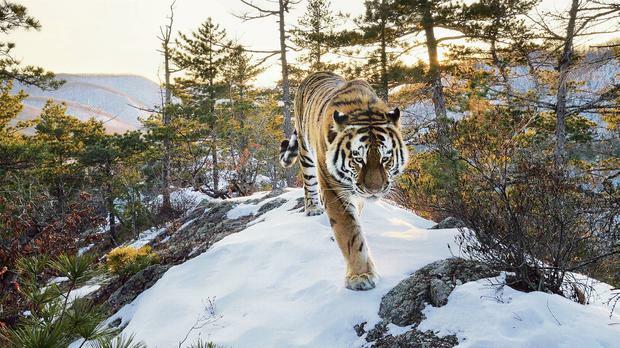 Tiger on Patrol: A male Siberian tiger – filmed by an Our planet camera trap – patrols a mountain ridge in the Sikhote-Alin range in the Russian Far East. ‘Pelican Fly-in’ – Temporary Lake Eyre. Whenever it fills with water, pelicans fly in from the coast hundreds of kilometres away, forming vast pop-up colonies where they feed on the lake’s fish and breed. The colonies can be half a million strong, far bigger than any colony on the coast. Nobody is sure how they know when to come. Fothergill, who studied zoology at the University of Durham before moving into filmmaking, enjoyed a nearly 30-year career at the BBC’s Natural History Unit before setting up his own company, Silverback Films, with co-producer Keith Scholey. Fothergill has been behind many of the BBC’s landmark series, including Blue Planet, Planet Earth and Frozen Planet. The new eight-part series, which is narrated by David Attenborough, offers a comprehensive exploration of biodiversity, with each episode centring on a different habitat, from jungles to deserts to coastal seas. Over the course of 3,500 filming days, a crew of 600 captured footage in 50 countries, including several species never before seen on film. Our Planet will be released on Netflix in full on April 5, accompanied by a book of stunning wildlife photography, some of which is featured on our pages today. The series, which Netflix expects to attract 1billion viewers, will also be supported by an online resource, ourplanet.com, in co-operation with the World Wide Fund for Nature (WWF). The site will be updated monthly with new information and advice on what individuals can do to reduce their carbon footprint. “Keith and I felt that the time was absolutely right to deal in depth with the environmental challenges our planet faces – still entertaining, still accessible, still a global series. That is challenging, because getting the balance between entertainment and messaging is a crucial one. If millions of people don’t want to sit down after a hard day at work and watch this series, we’ve failed,” says Fothergill. But, he believes, natural history programmes are uniquely positioned to help change public attitudes about the environment. He points to the BBC’s Blue Planet II, noting that he was “absolutely delighted” to see the effect the 2017 series had on cutting down plastic waste. Fothergill and Scholey are careful, however, to avoid turning Our Planet into a lecture. In the foreword to the book, David Attenborough writes of feeling “great hope”; that it’s not too late “to choose the future we want if we act now – and act together”. In a bid to motivate viewers, Fothergill has made sure each episode includes “good news stories”, such as the episode on forests, which concludes with a sequence in Chernobyl, the site of the 1986 nuclear disaster. Next up for Fothergill is a Disney nature film called Penguins, as well as a BBC series scheduled for autumn 2020, which aims to show the forces of nature, from storms to volcanoes, in a positive light. Silverback Films is also working on The Mating Game, a follow-up to 2015 series The Hunt, focusing on animal courtship and featuring a pop music soundtrack. But Fothergill sees Our Planet as an ongoing project, with the UN’s 2020 climate change conference its ultimate goal. “On April 5, all eight episodes will be available in 190 countries and, really importantly, it’ll be there for months and years. With many other broadcasters, they make a big noise around the original transmission – it might be on iPlayer for a month, and then it disappears,” says Fothergill.